Secure Attachment Viewing from Everywhere! What good is Outlook Web Access without attachment support? Many organizations are faced with just that but what is their alternative. Leaving attachment support turned on opens the organization to serious risk that important documents are being left behind in public kiosks and non-trusted systems? Ouch! What a dilemma. When using Outlook Web Access and users open attachments a download of the attachment actually takes place to the remote workstation. The operating system then calls the associated editor and displays the document on that workstation. Even if the user realizes this and deletes it after use the document is still easily retrievable from the systems trash folder and from the browsers cache. More often these documents are simply left behind in a temp directory forever. Sensitive documents fall into the wrong hands. Email today is less about sending messages and more about sending files and documents as attachments. Deploying OWA with attachment support turned off is really limiting one of the main benefits Outlook Web Access. When users are away from the office access to attachments is more important then ever. 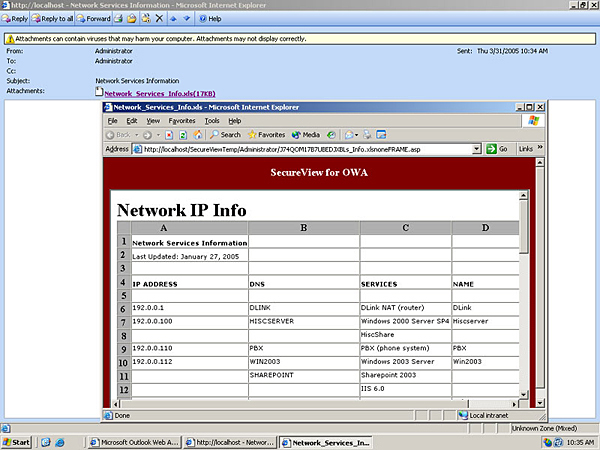 SecureView for OWA Enterprise 3.0 closes Outlook Web Access vulnerabilities. Users can View & access OWA attachments securely, never leaving any trace of the documents behind on non trusted systems. Documents never get cached on remote non trusted systems so there is nothing to clean up afterwards. Some technology are based on Java and Active X cache cleaners while great in theory they fail to work on many public systems leaving the user with out email. Integrates to Exchange front-end server for easy deployment to any size enterprise. Weather you have 1 or 100 Exchange Front-end servers SecureView Enterprise can easily integrate into any complex environment. The simplicity of SecureView’s architecture is that its does not interface directly with the backend Exchange systems. Even if there are multiple Front-end servers only one SecureView Server is needed. More can be deployed for performance. Deployed and proven in the largest global enterprise customers, please contact us for reference. Ultra Fast Viewing of over 375 document types. Users will load attachment views faster then any other technology due to our SmartCache view engine. The list of supported document types is impressive and includes all common MS, Corel, database, development and graphics formats. 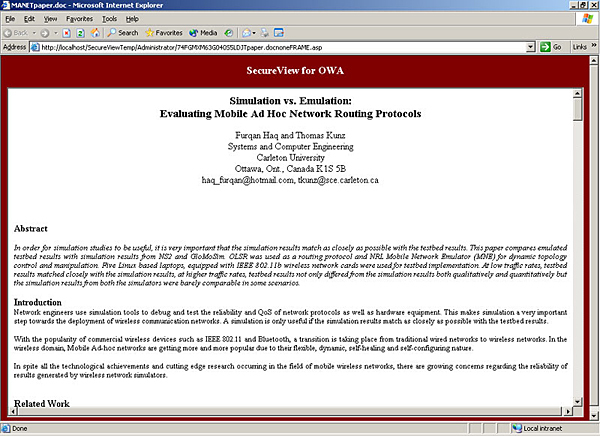 SecureView for OWA maintains all original file formatting and graphics when using standard view. Or view using Text-only which is maintains basic formatting and is perfect for PDAs and slower web connections. It also supports all browser types including Explorer, FireFox, etc. There is no need for ActiveX or Java client. Add user Productivity. SecureView for OWA is a great for user productivity and offers much more then security. Many times a view is faster then downloading a document and evoking the appropriate editor if available. Full for supports OWA 5.5, 2000 and 2003, and combinations in same enterprise. Many of customers have legacy Exchange systems deployed and need to support a mix of systems on mixed legacy server OS platforms. Users can right-click on mouse to select type of conversion Rich text, text or graphics. Documents in all OWA languages are supported and convertible. 100% client-less no ActiveX or Java applets are used are required with the browser, as attachment file transformation is performed at the SecureView server. 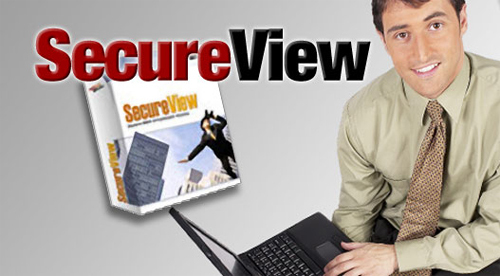 Users may search text within any SecureView file View. A table of contents is automatically created and hyperlinked so users can quickly navigate through the document. Attachments sent to multiple users from the same sender will be converted once to improve the performance of viewing of these attachments to all the users who view them. Access to attachments can be restriced based on the clients IP address. Multiple SecureView back-end servers can be shared from different front-ends and thus operation will not be interrupted should one or several of these back-end servers be down or taken off line for maintenance.